ORLANDO, Fla. – The nation’s top NCAA relay teams of the 2012-13 season and their coaches for each of the NCAA’s three divisions were recognized Tuesday by Accusplit, the leader in the professional stopwatch and timing industry since 1972, at the 2013 USTFCCCA Convention at the JW Marriott Orlando Grande Lakes in Orlando, Fla. 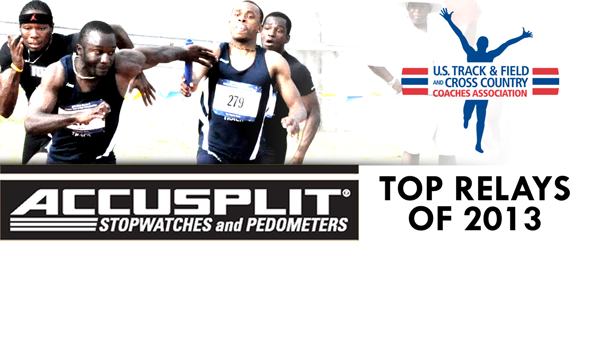 This marked the 32nd time Accusplit has honored the nation’s fastest collegiate relays and their coaches. The presentations took place during each division’s track & field general sessions on Tuesday. Accusplit has been the leader in the professional stopwatch and timing industry since 1972 with its invention of the first digital stopwatch. The company’s name is based on the stopwatch’s function of “accurately splitting” the time. Widely recognized as the professional sports timing brand in the United States, Accusplit has worked with elite athletes, such as Hall of Fame shortstop Ozzie Smith and Olympians Jackie Joyner-Kersee, Dan O’Brien and Ed Burke. The Northern California-based company was the Official Supplier to the Centennial Olympic Games in Atlanta in 1996. With 35 years of professional sports measurement experience in elite level sports, including track and field, swimming, baseball and football, Accusplit Pedometers and Pedometer-based Activity Wellness Programs are the tools that everyone in America and every golfer can use to achieve a healthier lifestyle.